Last weekend’s Herring Fair has been hailed as one of the best ever by visitors and stallholders. Thousands flocked to the event on the Stade open space, in Hastings Old Town. It was organised by Hastings Borough Council, to help support the local fishing industry, and encourage more people to visit the town out of season. As well as many stalls selling herring, there were cookery demonstrations in the Classroom on the Coast by CJ Jackson, chief executive of The Billingsgate Seafood School and star of the Sunday Brunch show. 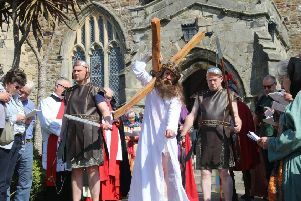 There were herring filleting demonstrations by ‘Tush’ Hamilton; net making demonstrations by local fisherman Richard Read; the traditional net blessing ceremony, conducted by Fr Luke Irvine-Capel; and music throughout the weekend from local artists. Council leader Peter Chowney opened the fair and said:“This is one of my favourite events. We’ve had some really great feedback on the weekend. The weather was perfect and it was probably the busiest Herring Fair we have ever had. “Not only is it a great visitor attraction, it has a serious point too. Our fishery, comprised entirely of small, under ten metre boats, struggles with quota, and is vulnerable to bad weather. Herring is less popular than it used to be, but though undervalued is a seriously versatile fish. Promoting its use helps the local fishing industry, and local economy.